1. 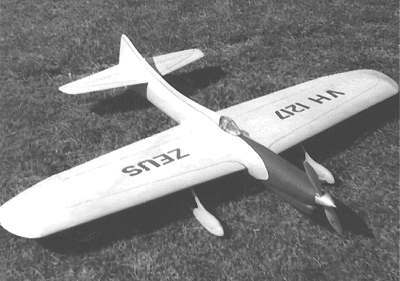 Back in 1955 Stan Pilgrim was a junior member of the Sky Hawks Model Flying Club of Australia, based in Sydney. Pictured here at the 2001 Nationals with his Vintage A teamracer, Stan and his team mate Peter Camps set the fastest heat time yet recorded in this event at a Nats, and finished second in the final. 2. 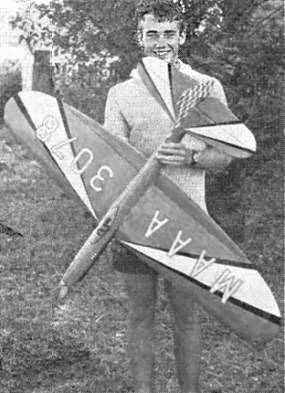 Brian Eather was winning FAI teamrace events as far back as the Echuca Nationals of 1961, where he also placed second in aerobatics. In more recent years Brian has become more of an aerobatics specialist, winning a couple of Nationals and numerous other events. 3. Andy Kerr has tinkered with all sorts of speed and racing models over the years, with his talent for getting peak performance from racing engines bringing him many successes. Record holder in the Vintage A teamrace event at the beginning of the twenty-first century, Andy is pictured here at the 2001 Nats, which did not go his way. 4. This trio of Victoria's most decorated aerobatics champions is showing off a famous Class 2 teamracer: the Grassfire of Les Squires, winner of the 1959 Nationals in a record time that stood for years. At left is Ken Taylor, winner of aerobatics at the 1964 Nats plus others, and competitor again at the 2001 Nats. Centre is Peter White who tied with Doug Grinham (right) for first place in Vintage aerobatics at the 2001 Nationals. 5. Keen promoter of Classic and Vintage teamracing, John Hallowell, is pictured here with famous American, George Aldrich at the Wagga Nats in '92-93. In the early nineteen sixties John was flying Class 2 teamracers and making his mark in Junior Stunt contests, winning the Victorian and Australian title in 1962. Since then his successes have included flying to a win in Vintage Teamrace at the British Nats, collecting 4 National Bendix Racing titles and a win in Classic B at the 2001 Australian Nats George Aldrich is a multiple aerobatics winner at American Nats, and designer of the Nobler stunter, the plane that has probably won more aerobatics contests in the hands of more pilots than any other. 6. Western Australian Charlie Stone describes his aeromodelling beginnings in detail on his web page, where you can also hear his favourite sound clip, the Air Adventures of Biggles. Western Australian State Champion several times over, Charlie is pictured here in his role of Contest Director at the Nationals of April, 2001. 7. In the early nineteen sixties Hans Bertina established his reputation as a teamrace winner with Charlie Stone in Perth, then spent a year in Victoria where he enjoyed further success. Pictured here with a stunter at the Western Australian Nationals of April 2001, Hans also competed in the following Nats where he came 4th in the Classic B Team Race. 8. Brian Horrocks brought fame to Australian modelling in the early nineteen sixties by twice winning the Gold Trophy for aerobatics in Britain. He occasionally comes out of retirement to act as an aerobatics judge these days, which he was doing when this picture was taken at the South Australian State Champs of 2002. 9. 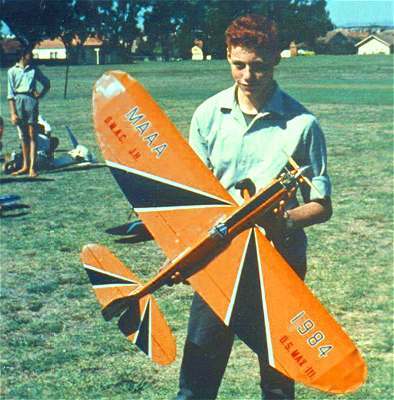 Robin Hiern started flying control line as a young boy at Bunyip Primary School in 1958. His first model was a Hearns Hobbies Super Hot Rod with a Taipan 1.5 motor, a combination which lasted half a lap. 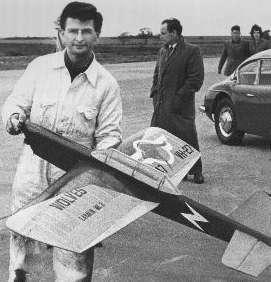 Robin is pictured here with his Profi powered FAI speed model with which he set a record of 284.75kph in April of 2002.